Dr. Bing-Yi Pan joined AIRS in February 2011 and is participating in all three of the Research Streams, in particular the AIRS Test Battery (1.3), the Analysis of the voice study (2.2. ), and Intercultural understanding (3.1). His doctoral background is in physics but he has also an education degree in music. Pan, B. Y., Liu, D., and Cohen, A. J. “AIRS-test: A web-based, audiovisual recording experiments system,” in prepare. Pan, B. Y., Liu, D., and Cohen, A. J. (2012) “A system for developing a series of interactive tests of vocal production requiring on-line audiovisual recording,” J. Acoust. Soc. Am., 131(4), 3377-3377. Pan, B. Y. (2011). “A preliminary view of some foundational and contemporary research on singing in China: Introducing translations of two contrasting works,” Psychomusicology: Music, Mind & Brain, 21, 208-211. Lin, J. Q. (林俊卿), (1962) Scientific Principles of Singing, Chapter 4 Artistic Application of the Voices, translated from the Chinese by Pan, B. Y., Psychomusicology: Music, Mind & Brain, 21, 212-226 (2011). Wu, J. (吴静), (2007) “Interpretation of the acoustical analysis of the timbre of Chinese National Singing: female example,” translated from the Chinese by Pan, B. Y., Psychomusicology: Music, Mind & Brain, 21, 227-237 (2011). Pan, B. Y., and Cohen, A. J. (June 7, 2012) “The AIRS on-line test battery of singing skills,” in the symposium: New test instruments to study singing: Perception, Production, and Emotion, CSBBCS (Canadian Society for Brain, Behaviour and Cognitive Science) 22nd Annual Meeting; Kingston, Ontario, Canada. Ross, E., Leblanc, M., Pan, B. Y., and Cohen, A. J. (June 16, 2012) “An age-cross sectional study of singing skills,” in the symposium: Singing across the lifespan: Active and passive behaviours, the 73rd Annual CPA (Canadian Psychological Association) Convention; Halifax, Nova Scotia, Canada. Pan, B. Y., Liu, D., and Cohen, A. J. (May 16, 2012)” A system for developing a series of interactive tests of vocal production requiring on-line audiovisual recording,” the 163rd meeting of the ASA (Acoustical Society of America); Hong Kong, China. Pan, B. Y., and Stevenson, L. (July 22, 2011) “Factor influencing performance on the AIRS TEST of Singing,” 3rd Annual AIRS Summer Workshop; Charlottetown, PE, Canada. Chen-Hafteck, L., Andango, E., Pan, B. Y., Xiao, Y., and Broofck A. (July 12, 2011) “Understanding cultures, singing songs: Let’s learn about Brazil, Canada, China & Kenya,” The Phenomenon of Singing, international symposium VIII; St. John’s, Newfoundland & Labrador, Canada. Pan, B. Y., Stevenson, L., and Cohen, A. J. (July 11, 2011) “Does accuracy of singing the major triad predict accuracy of contour production in an unfamiliar song: A cross-cultural study based on the AIRS test battery of singing skills?” 3rd Annual Meeting of AIRS (Advanced Interdisciplinary Research of Singing); St. John’s, Newfoundland & Labrador, Canada. Pan, S. S., Pan, B. Y., Lane, J., and Cohen, A. J. (June 14, 2012) “The influence of native language (Chinese versus English) and personality on performance of tests of singing,” the 73rd Annual CPA (Canadian Psychological Association) Convention; Halifax, Nova Scotia, Canada. Stevenson, L., Pan, B. Y., and Cohen, A. J. 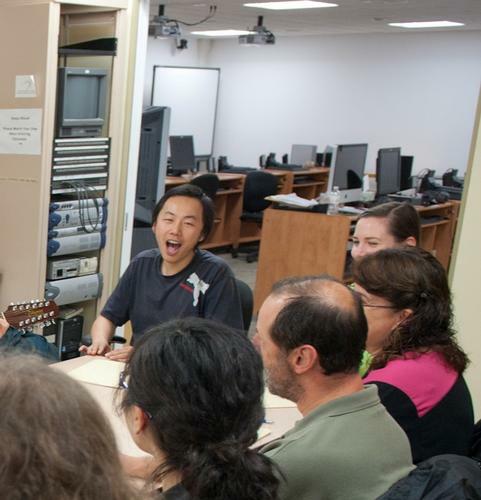 (August 11, 2011) “Sing a new song: Effects of native language (Chinese versus English) on learning an unfamiliar tonal melody with lyrics (Chinese versus English),” the 2011 biennial meeting of the Society for Music Perception and Cognition (SMPC); Rochester, New York, United States.